It’s been fairly quiet on the FFBF Blog over the last couple of weeks. During the last few weeks I’ve been creating more Kindle Books, I’ve set up and completed my first Coaching session with a paying client, and I’ve finalised some details for the UK Gathering. OK, to say I’ve been busy finialising details for the UK Gathering is a little unfair. My good friend Darren has done all the leg work for me (literally). I’ve just emailed him a few times. I met Darren at the first Gathering I organised at Symonds Yat in the New Year. He was brought up in Stratford Upon Avon, and suggested helping me out with some suitable locations for the UK Gathering on 21st March 2015. He kindly suggested walking around the town this past weekend and checking out some options based on the estimated numbers we’re expecting. To my knowledge, based on the people that have either emailed me back, or left a comment on the blog, I’m expecting anything between 7-16 people to attend the gathering. That’s not taking into consideration people that don’t leave comments, haven’t emailed me or have said they might be able to go. I’ve gone on people that have confirmed so far. The information I’m about to share is all off the back of the work Darren did. Thank you once again Darren! People can park for free (without time limit) on Bridgetown Road (CV37 7JH). It’s a nice area, so cars will be safe. The walk into town is ten minutes. There is also plenty of parking in the town, but you need to pay. The choice is yours! We’ll be positive about the weather and suggest meeting at the Swan Fountain Sculpture in Bancroft Gardens, at 10am. The post code is CV37 6BD. If the weather is likely to be poor for the Saturday morning, I’ll send a Blog Post and a Tweet out to everyone on the Thursday or Friday and suggest meeting in our back up, indoor location, Carluccio’s. The restaurant is very close to the Swan Fountain, the address is 13 Waterside, Stratford upon Avon, Warwickshire, CV37 6BA. 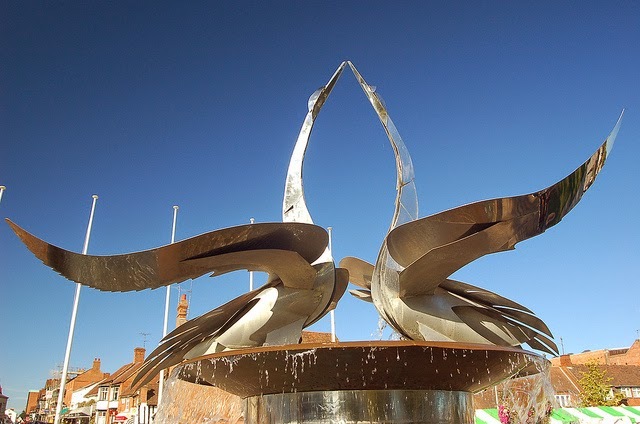 Just to clarify, we’re meeting at the Swan Fountain Sculpture unless the weather takes a turn for the worse. If you’re joining us for the day, please email me direct on the contact form on the right hand side of the Blog, and I’ll email you my mobile number. For people arriving after 10am, please call me or text me to let me know when you’re in town and me or someone else from the group will come and meet you. Ideally, if you could let me know in advance roughly what time you’re arriving that would be really useful. We can set the day up to be around the locations mentioned above and meeting up with you will be much easier for everyone. Once we’re all in attendance, we can hang out in the park, walk along the river, or hit the cafes or pubs. I really don’t mind what we do, and I think it’s best not to plan anything for the day itself. Let’s just meet up, chat and see where the day takes us! I’m planning on stopping overnight with Miss FFBF, I’ve not booked anything yet. As and when I do, I’ll let you know where I’m staying so you’ll know where to avoid! We’re likely to stop in a hotel in town, nothing special. Miss FFBF and I will spend the Sunday morning scoping out the town and the SoA sights. You’re all welcome to join us if you’re interested. We won’t in any way be offended if you’d prefer to do the same thing on your own or with your family. I think I’ve covered all the basics. Please let me know if you have any questions about the day. Just writing this post has got me excited thinking about the day. I’m really looking forward to meeting you all in person. It’s 3 1/2 weeks away now! Hi Huw, I'm hoping to join you on the 21st as well, although don't think I'll quite make it for the 10am start! Train tickets are quite cheap from London so I'll come along for a few hours. Great work on organising the meet-up, it's really nice to see something like this to bring faces to names. Thanks for the update. I've booked my train, should be getting into Stratford around 11.40ish. Looking forward to this! Both myself and my wife will be attending the UK gathering on 21st March. We live in the Yorkshire Dales which is a 4 hour drive away, therefore we will most likely drive down on the Friday night and stay over. Fantastic news, and I have to commend you on your commitment to join us with a 4 hour commute. I look forward to meeting you and your family on the 21st March! As I'm dragging her away for the weekend, she has asked if I would join her for some tourist action on the Sunday. We're very much open to ideas and locations. Thank you for the suggestion! No problem at all. I'll email you my mobile closer to the date. Drop us a line when you're in town and we'll let you know where we are. Really looking forward to it now! I really hope you can make it. Don't worry about the start time, we have people arriving at all sorts of times. Can you leave a brief note me on my contact form and let me know your email address. I'll email through my mobile number so you can call me when you arrive. I'll let you know where we are at the time and we'll make sure someone meets you/directs you to where we are. A commute from London is very impressive. Thank you do much for making the effort! It's my pleasure. I'm so pleased people are interested in meeting up. I feel the same way. I'm looking forward to meeting the people behind the Blogs/comments. It looks like there will be a reasonable crowd on the Saturday. Myself and the good lady are getting excited about this. It's going to be great meeting everybody. See you all in just over three weeks. Great news! Yes, it looks like we're going to have a great turn out. I can't wait! Hi Huw, sorry I haven't sent through my details yet but unfortunately it looks like I won't be able to make it after all – the trains seem to have completely melted down due to a landslip which has cancelled all direct services between London and Stratford until April!! While I'd love to join you, I refuse to pay double the fare for a journey that's 3 times as long with as many changes. Have a great time and hopefully I'll be able to join you all in the future. No worries. What a shame! I completely understand. It's my intention to make these meet ups a regular thing and the next one in the summer is likely to be Dan Saff, so hopefully we can meet up then. The chiltern line should be reopening this Friday 13th mar so no long bus transfers! Keep an eye on the rail website as it should announce the opening as the landslip has been sorted. A better journey time from London to SoA. Thanks for that Sparklebee! I appreciate you sharing the knowledge. I hope this enables more people to come along. All the best!